Youth is a limited resource we exchange for wisdom. Then we buy sports cars in an attempt to regain some of what we’ve traded away. In that same vein, I have continued to be an avid LEGO fan from my youth through to today. Whenever they launch a new line of automotive-themed sets, I run out to my nearest toy store (sadly, being closed nationwide now). This recent round has been a bit more difficult to find locally than usual, as they were sold out the last few times I've visited the store. Yesterday, I finally managed to get my hands on both of the new Porsche Speed Champions sets, and they are as great as I expected them to be. The finished result can be seen below, and while a bit blockier than the real thing, the shapes came out remarkably recognizable. This single-car kit comes with one minifig racing driver and a small pit-exit style stop/go light and a telemetry-graphic laptop accessory. The ancillaries in kits like these are always secondary, as the car is the most important piece. In the case of this 919, the car is quite good. The shape is convincingly accurate, and doesn't need any special components outside of LEGO's normal offerings to achieve that look. 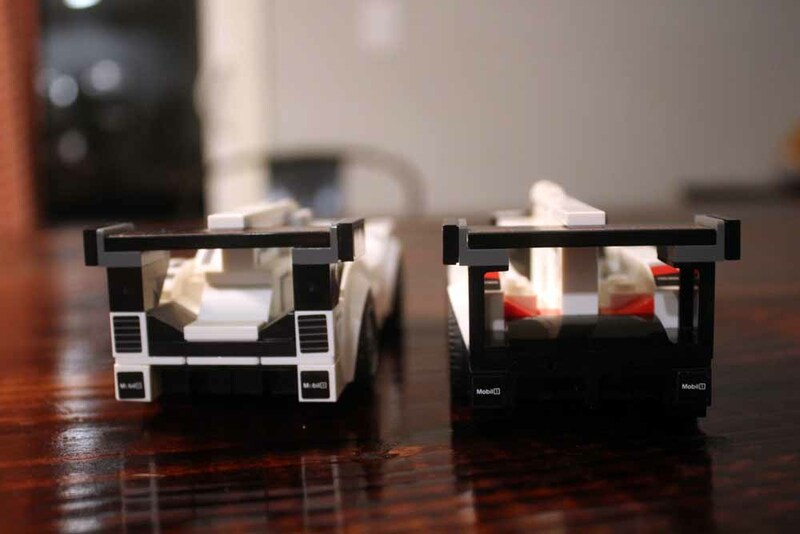 It's quite interesting to note the differences in the car's shape from the 2015-spec 919 Hybrid LMP1 LEGO built as part of the 919 and 917 kit (more on that later). Each of these three LEGO Porsche builds weren't particularly hard or complicated, taking around 45 minutes per Porsche to complete from beginning to end. A lot of that time was wrapped up in the decal application, as I have particularly large hands and an indelicate shaky grip. It may take a bit longer for a young child, or even an adult helping a young child, but you're buying a kit like this to provide at least an hour of entertainment for a kid, right? That's the goal. As an adult without children, I think that I also got the entertainment-per-dollar ratio right with these kits, because I was able to turn off my cell phone, put a good record on, and let my cares melt away for a couple hours, and that's so rare these days. Of the two sets, this one feels like a particularly good price for both the entertainment value and the quality of the kit. Not only did it include twice as many Porsches for less than twice as much money (at least when I originally bought it), but this might be my favorite LEGO build in thirty years of building LEGO. The 911 Turbo: I was particularly interested to see how the designer dealt with some of the 911's curves. I loved the creative way in which they incorporated Porsche's headlights to be forward facing and properly mount the fenders. The proportions aren't 100% right, and the wheels in particular are a little wonky, but it's a nice piece that I'm happy to have on my office shelf. The color, in particular, is just great. The 911 RSR: The proper racing car nature of the RSR means that LEGO was able to take advantage of some of the Porsche's more exaggerated proportions in brick form. The wide fenders front and rear fit in well, and the elevated rear wing looks the part. I do feel that this particular design lets the decals do a lot of the heavy lifting, but it's near enough to the shape that they can get away with it. Not only did this kit have two incredible 911s, the start-finish line accessory was a welcome addition. There are a few cool extras with this piece, including the mechanic's lap timer board, and the rotating lap counter on the overhead gantry. It's more than just a cheap add on, it's actually fun to build. 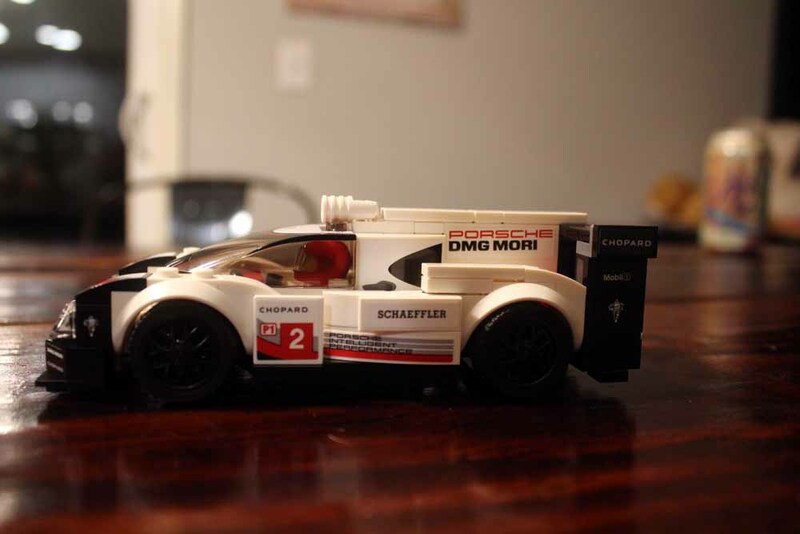 Any way you slice it, a 919 Hybrid built out of LEGO is cool. But it's even cooler that LEGO has two different designs. Let's compare the two. Aside from a simple livery change, LEGO went the extra mile to make sure their new design is appropriately different enough to match last year's design. There is a bit of similarity between the two designs, but clearly a lot changed between 2015 and 2017. The front fenders of the 2015 design are much more narrow and upright, as they were in the real-life car as well. For 2017, Porsche laid back their fenders and brought the front of the car more level, and drastically widened the front headlights. The sides of the 2017 model are much more shapely as well, curving inward with delicate aero strakes, while the 2015 car is more slab-sided. Out back, the Porsches are relatively similar still, with the 2017 car's deck being a bit more flat and the wing uprights being a bit taller and thinner. Both cars are about the same width (about 6 studs wide) and length (about 18 studs long), and some more similarities are visible from above. I found it interesting that both car's air inlets above the driver compartment look fairly similar in real life, but are drastically different in the LEGO version. And, for comparison sake, here is the 2015 919 Hybrid and the 2017 919 Hybrid, respectively.